On February 18, months of hard work paid off for students of grades four to eight of the Black Gold School Division (BGSD). Eleven schools in the School Division #18 enlisted in a battle of brains and confidence to determine who would be the top three best spellers in the region. Mrs. Cassie Peters is a grade six teacher at Caledonia School with a passion for reading, spelling and the correct use of the English language. 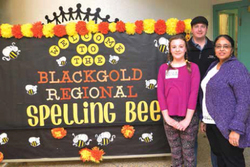 She planned an in-school Spelling Bee in early February that singled out Charlie Heinz (gr.6) and Kaylyn Fraser (gr.4) to represent Caledonia in the Regional Spelling Bee, also held at Caledonia School and also organized by Mrs. Peters. The eleven schools sending representatives with their sharp minds and spelling skills were: Caledonia Park, Willow Park, Leduc Estates, École Corinthia School, Warburg, Covenant Christian, Calmar Elementary and Calmar Secondary (Junior), New Sarepta Elementary, Beaumont’s École Coloniale and Robina Baker in Devon. The official ‘Pronouncer’ was Calvin Monty, the Black Gold School Division’s Associate Superintendent, who loaned a friendly tone to the proceedings. Youths showed impressive composure, some spelling quietly at the microphone while others spoke with booming confidence while parents and family members at the edge of their seats applauded at each spelled word. The top three 2015 Regional Spelling Bee Winners, with their cash prizes were: Kelsea Zurbrugg from Calmar Elementary, Grade 6 ($200); Myla Klyne of Leduc Estates, Grade 6 ($150); and Carter Brackley from Warburg School, Grade 7 ($75). Well done, kids!. Decorations, cash prizes and other Spelling Bee expenses were generously supported by these sponsors: Back Gold School Division, Budget Drywall, The One 93.1 FM, Leduc Optimist Club, and one enthusiastic, anonymous Leduc resident. Several parents and spectators expressed their wish that this would become an annual event in our region. Organizer Mrs. Peters hopes that more schools will increase the Spelling Bee’s level of competition by entering next year. Pictured: Kelsea Zurbrugg of Leduc County poses with her dad John and Mrs. Wilson, her Grade 6 Calmar Elementary teacher. Photo by Dominique Vrolyk. See another event photo in this week’s paper.